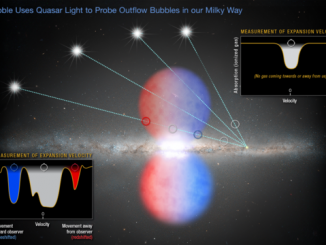 For years, astronomers have theorised that energetic galaxies powered by supermassive black holes, whether quasars, blazars, Seyfert galaxies or other varieties are driven by a similar mechanism now collectively known as active galactic nuclei, or AGNs. The “unified model” describing these enormously powerful galaxies called for a central supermassive black hole, a rotating disk of in-falling gas and dust surrounding the central black hole and jets racing outward from the poles of the disk. To explain why some of these enigmatic objects look different when observed from different angles, theorists assumed a thick, doughnut-shaped torus of dust surrounding the inner regions that would provide different views depending on the angle between the plane of the galaxy and the observer. Now, using the Karl G. Jansky Very Large Array (VLA) radio telescope, astronomers have made the first direct observation of the dusty torus surrounding the central black hole powering one of the most powerful radio galaxies in the known universe – Cygnus A. Located some 760 million light years away, Cygnus A features a central black hole 2.5 billion times as massive as the Sun, driving huge jets of material spewing outward at nearly the speed of light and producing titanic “lobes” of brilliant radio emissions. 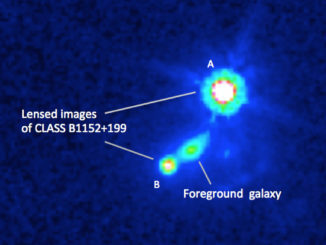 The new observations appear to confirm the unified model of AGNs. 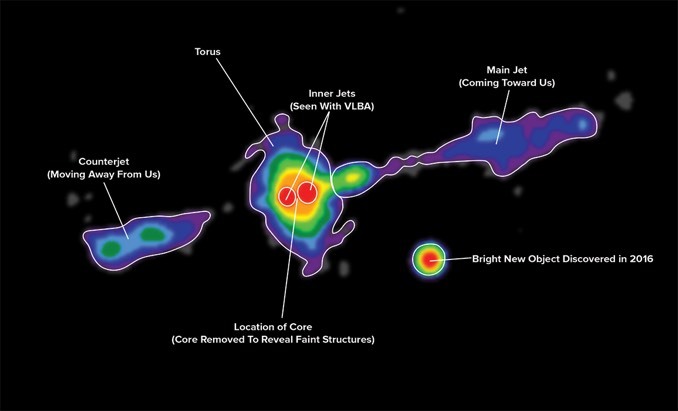 The VLA observations directly reveal the gas in the torus surrounding Cygnus A’s gargantuan black hole, a torus with a radius of nearly 900 light-years. The idea of a dusty, obscuring torus was first proposed in 1977. Then, in 1982, Robert Antonucci of the University of California at Santa Barbara presented a drawing of an opaque torus surrounding the central engine of an active galaxy. From that point forward, such a torus was included in the unified model. 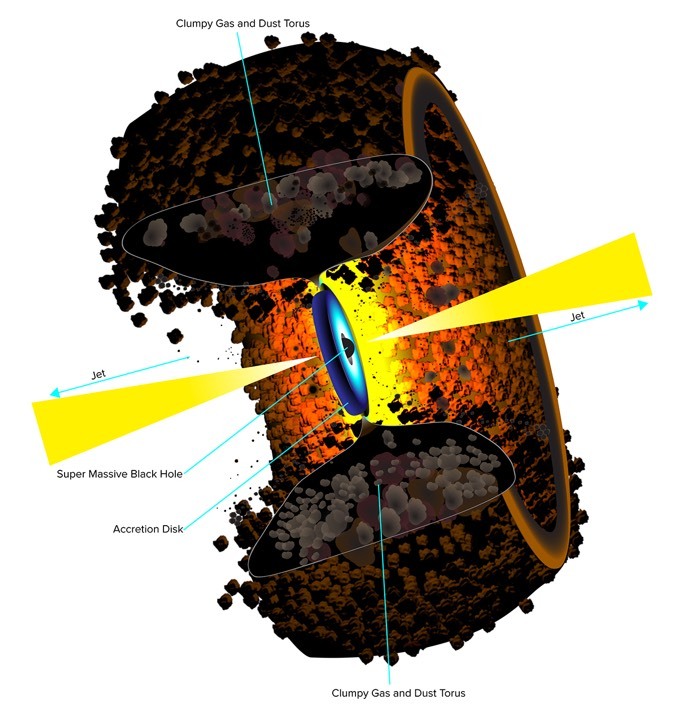 Carilli and Perley, along with Vivek Dhawan at NRAO and Daniel Perley of Liverpool John Moores University in the UK, discovered the torus during follow-up observations of a bright object near the core of Cygnus A, discovered in 2016, that may be a second supermassive black hole. If so, the two holes may indicate Cygnus A merged with another galaxy in the relatively recent past. In this NASA/ESA Hubble Space Telescope image we see the striking face-on spiral galaxy NGC 6814, whose luminous nucleus and spectacular sweeping arms are rippled with an intricate pattern of dark dust. 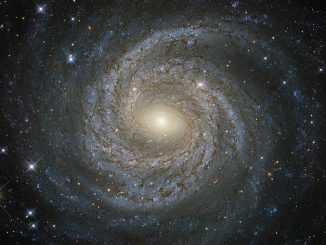 The galaxy was discovered by William Herschel in 1788. NGC 6814 lies 74.4 million light-years away in the constellation of Aquila.